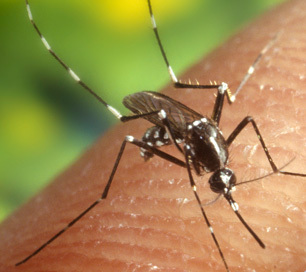 Malathion is used to control disease-carrying mosquitos. Malathion is an insecticide used to control insects that affect vegetables, fruits, nurseries, pastures, ranges, and residential landscaping. It's used pharmaceutically to control lice and scabies, and it's often used to control mosquitoes that carry the West Nile Virus or Dengue Fever. Malaoxon is a metabolite of malathion that may develop during water treatment involving chlorine. In most environmental conditions, malathion persists in water for only a week or two, but with the right pH and microbial conditions, it can persist for years. Still, the World Health Organization reports that it is not likely to be present in drinking water at levels of health concern. Malathion on its own is of low acute toxicity, but it can metabolize into the more toxic chemical malaoxon. Malaoxon can inhibit the enzyme cholinesterase, leading to symptoms of nausea, dizziness, confusion and, with exposure to very large amounts, respiratory paralysis and death. Malathion can be treated with activated carbon. According to Lenntech, activated carbon has a “very high probability” of adsorbing malathion.